AllTheAnime.com Exclusive Mobile Suit Gundam Movie Trilogy arrives in March. Blu-ray Collection Limited to 500 units arrives on 27th March. This set will contain all three movies, is limited to 500 units and is exclusive to our AllTheAnime.com web shop. These movies were designed to be a way to retell the original Mobile Suit Gundam series in a condensed way spread over the course of three films. They have previously been released on DVD in the United Kingdom, but that release has long since been out-of-print, but we are now bringing these to Blu-ray for the first-time in the United Kingdom! A very interesting detail to note about our release is that it will contain both the 2.0 and 5.1 audio versions of the film. There is a distinct difference between the two in that the 5.1 version (also known as the “Special Edition” of the Movie Suit Gundam Movies) was recorded with a different “rearranged” soundtrack compared to the 2.0 version. So you actually two entirely different viewing experiences of the each film in this set! The first movie uses existing footage from the series, while Movie II: Soldiers of Sorrow and Movie III: Encounters in Space utilise a mixture of new animation and original footage. Synopsis: “Universal Century 0079. 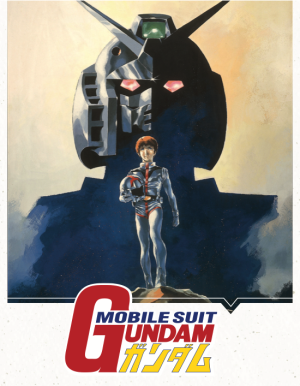 Amuro Ray, a normal boy, finds himself the newest soldier in the war between the Earth Federation and the Principality of Zeon when he becomes the pilot of the Federation’s prototype Mobile Suit called Gundam – their greatest new hope. 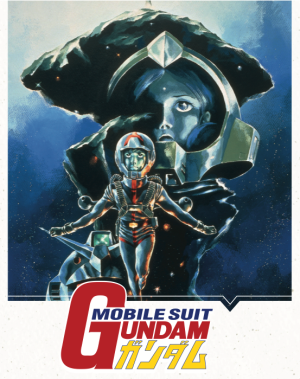 Synopsis: “The war rages on, and the Federation ship White Base continues to do battle with the Zeon forces as they undertake the long journey to Federation quarters in Jaburo. But turmoil from within also threatens to tear the White Base apart. One crew member must confront her past. one will desert just when the others need him most. And one will find true love, but at an alarming cost. Synopsis: “The One Year War enters the final stages. The constant fighting has weakened both sides considerably, and the Zeon forces begin taking desperate measures. Amidst a break in the fighting, Amuro meets a mysterious girl named Lahla, whom he is strongly drawn to. There is a connection there, a feeling beyond words to express. She is like him and they are both something more than human. It’s Federation vs. Zeon, brother against sister are in turmoil! 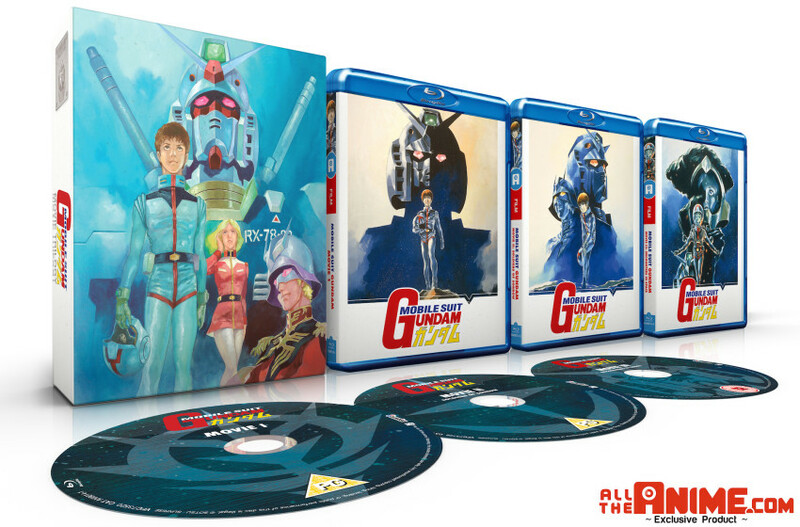 This AllTheAnime.com Exclusive Mobile Suit Gundam Movie Trilogy Blu-ray set will be released on 27th March and is limited to 500 units only. The comes in a rigid case and inside that you will find three amaray cases, one for each Mobile Suit Gundam Movie. Also worth noting from the outset that these films are in Japanese with English subtitles only. There is no English language audio for these films. Until Thursday 16th March 2017 pre-order for this set for only £24.99 (regular price £34.99). —- How many of these sets are being produced? There are 500 units in total. So once it’s sold out it will no longer be available. —- Will I be able to purchase this elsewhere? Excluding any events that we, Anime Limited / AllTheAnime exhibit at, this product is currently exclusive to AllTheAnime.com. This may change in the future, but at this stage it’s too early to tell. We want to make sure everyone has the opportunity to purchase this product, but as it is only 500 units being produced – which is not a lot at all in the grand scheme of things, we want to be able to manage the distribution of this ourselves, at least to start with. —- What’s the regular price of this set? The regular price is £34.99. But for the period of our early-bird offer you can order it for £24.99. —- Is there English audio like there was for the Mobile Suit Gundam TV series Blu-ray you previously released? No. Though there was an English language audio option on our release of the Mobile Suit Gundam TV series, these films are only in Japanese with English subtitles. —- You haven’t mentioned previously this would be coming. Is there a reason why you’ve only decided to announce this now? Yes. Originally these were not scheduled to be part of our partnership with Sunrise to release, but there was a unique opportunity to bring these films over and we decided it would be great if we could! But taking into account the unique nature of this release, we really want to cut down the lead time on us being able to announce upcoming titles and then the product being in your hands. We’ve been working on this behind the scenes for a while, but with everything being signed off, locked in and now in off to production, today is the perfect time to announce this. And best of all with you can now order this knowing it’s due by the end of this month! —- Will these movies be available in any way at a later date, assuming this set sells out? Quite possibly, yes. But at this stage it’s too early to say. But it this were to happen it wouldn’t be presented in the same way as this set exclusive to our site is. —- As these movies are quite old, how they be displayed? When these movies were made it was before 16×9 became standard for anime. As such is was animated for viewing on older 4:3 ratio televisions. To retain its originally intended video size, black bars will appear at the sides of televisions when viewing the movies. And there you have it! 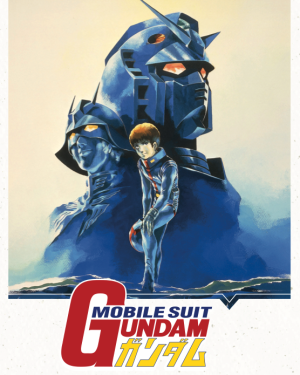 The Mobile Suit Gundam Movie Trilogy coming to Blu-ray, exclusive to AllTheAnime.com, from 27th March. We hope you’re looking forward to this but if you have any questions please do feel free to ask in the comments below or through our Facebook / Twitter pages. Hello, I know these are region B. But I know some Blu Ray will still play on multiple region players. Will this play on my region A PS4?